In honor of Women’s History Month, Clark Partington offers a mini-series focused on inspirational women. The featured quotes and the women who spoke them have had an impact on the authors of these blogs. In each blog, you will get to know the influential women in history, as well as Clark Partington attorneys. This blog was authored by Elizabeth Billhimer and Anastasia Stull. We hope you will be inspired! Florence Nightingale was born on May 12, 1820 in Florence, Italy. She is legendary for tons of reasons – including improving conditions at a British base hospital (thus reducing the death count significantly), sparking worldwide healthcare reform through her writings, and establishing St. Thomas’ Hospital and the Nightingale Training School for Nurses. When Florence initially told her parents, Frances Nightingale and William Shore Nightingale, that she wanted to be a nurse, they forbade her to pursue nursing – especially because they were wealthy and wanted her to marry a rich man, not pursuing a job that, in the Victorian Era, was viewed as lowly. Despite her parents’ angry objections, she enrolled at the Lutheran Hospital of Pastor Filedner in Kaiserswerth, Germany as a nursing student in 1844. During the Crimean War, Nightingale worked constantly at a British base hospital, earning her the nicknames “the Angel of the Crimea” and “the Lady with the Lamp” (because she made nighttime rounds to tend to patients while carrying a lamp). Using her experiences in the Crimea, she wrote an 830-page report on proposed reforms for military hospitals with poor conditions. Upon coming back home, she was treated as a hero, and the Queen gave her an engraved broach now known as the Nightingale Jewel, along with $250,000. 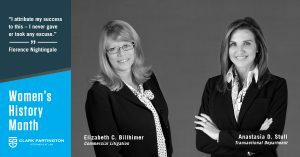 Elizabeth C. Billhimer Elizabeth joined the firm’s commercial litigation group in early 2016 after practicing in Washington, D.C. for more than a decade. Elizabeth is a native of Niceville, Florida and has returned home to bring the benefits of her D.C. experience to serve the legal needs of our local and regional community. Elizabeth has extensive experience handling complex legal matters. In D.C., her practice focused on general litigation matters, including representing companies and individuals in civil and criminal government enforcement actions, bid and grant protests in administrative and judicial forums, and conducting corporate internal investigations, compliance reviews and risk assessments. Cameron can be contacted at ebillhimer@clarkpartington.com or 850.269.8853. Anastasia D. Stull is a member of Clark Partington’s Transactional practice group and focuses on business formation and organization, negotiation and transactions, corporate governance, and financial institution consumer compliance, including matters involving medical marijuana. Tasia was previously Senior Regulatory Counsel for the Consumer Bankers Association representing the largest retail banks in the U.S. on a myriad of regulatory, compliance and business issues. She also practiced with the law firm Buckley Sandler LLP in its regulatory, litigation and enforcement group, and held a senior position with several prominent consulting firms in both Washington, DC and New York, NY. She was an attorney in the General Counsel’s office of Merrill Lynch International Bank’s Global Private Client group in London, UK and began her career at the Securities and Exchange Commission’s Division of Enforcement. Tasia can be contacted at astull@clarkpartington.com or 850.269.8858.